Have a little Irish in your blood? Even if you don’t, you can still kick up your heels at the St. Patrick’s Day festivities in the City of Crown Point March 17th. 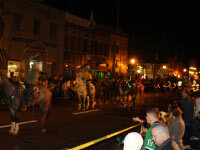 The nighttime parade has grown over the years, bringing together more than 10,000 people to celebrate. Start off your St. Patrick&apos;s Day celebrations with a meal of corned beef and cabbage at Crown Point&apos;s downtown firehouse. Reserve your meal by calling the city&apos;s parks department at 219-661-2271. If you’re really ready to put your heart into it (and your hair), join in to raise some funds for St. Baldrick’s, a nonprofit organization dedicated to raising money to fund research into childhood cancers. 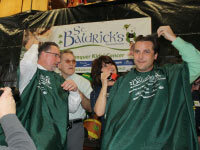 In 2011, a lot of heads were shaved and more than $50,000 was raised! Three local mayors (David Uran of Crown Point, Thomas McDermott of Hammond and Keith Soderquist of Lake Station) joined in the effort as well and shaved their locks. Register and get more information on this event at www.stbaldricks.org. After your stomach is full and your head feels a little breezier, walk over to the square for the nighttime parade. Feel the Irish spirit when the Lake County Pipes and Drums and Band of Brothers Pipe and Drum Band (made up of firefighters from both Indiana and Illinois) march down Main Street. There are always unique participants in the parade. Last year’s event included a bulldog (the city’s high school mascot) being pulled in a wagon by a man on a bicycle, Molley the Trolley transported a full-load decked out in green lights, and a lovely young man dressed as a princess rode in the back of a truck (hey, anything goes in the St. Patty’s Day parade). I’m sure there will be even more this year to keep us all entertained. Take in the nightlife of downtown Crown Point while you’re there. The city has quite a few restaurants and bars along the square which will have their doors open for business. How do you celebrate St. Patrick&apos;s Day? Comment and let us know!